I’m living at home in Ireland for the foreseeable future, and what a summer to move back to. I have to admit that i’m really not the best person in the heat…it makes me really grumpy and uncomfortable but it is lovely to see the sun shining and everybody in a generally happier mood. Alas, it did start raining again 2 days ago…which makes sense because we really needed it, grass doesn’t look right when it’s yellow. I made these for my mum when one of her friends was popping over for some lunch. Thought it would suit the high tea atmosphere, they really enjoyed them. These guys are as easy to make as a cucumber sandwich so give them a try…they might be hard to pronounce but once you get around that the hard part is over. Line a large baking tray with greaseproof paper or a silicone sheet. 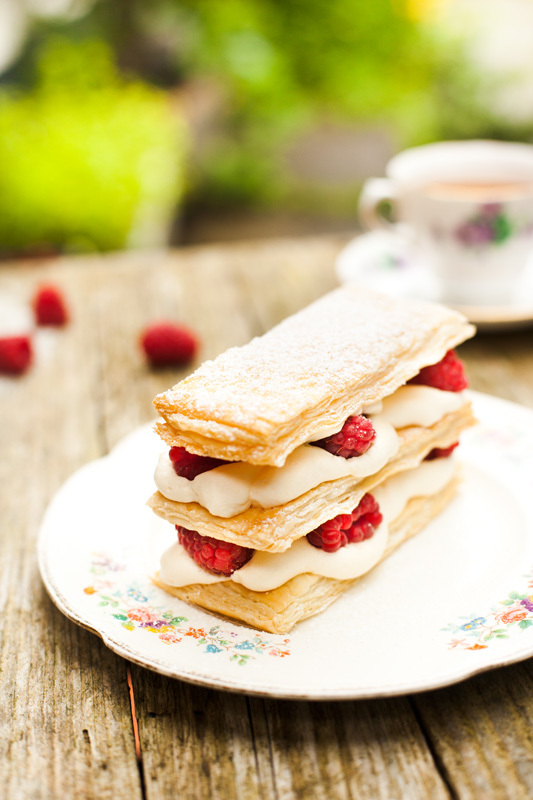 Sprinkle your work surface with lots of icing sugar and roll out the pastry to a rectangle just larger than 27 x 30cm. Cut around the edges so everything will be even. Try and make it as thin as possible without stretching or ripping the pastry. Cut out as many rectangles as you can to about 9cm x 5cm (if you want to be technical) and place them on the prepared baking tray. Sprinkle with lots of icing sugar and put in the fridge for around 30 minutes to chill and keep their shape. Meanwhile preheat the oven to 200°C or 400°F. Take the pastry rectangles out of the fridge and prick all over with a fork, sprinkle with icing sugar and place in the oven for around 15mins. After 5 minutes you will notice they are starting to puff up, take them out of the oven and sprinkle with some more icing sugar and squash with a spatula or something similar. Pop back into the oven until they are nice and golden but keep an eye on them not to puff up too much, just keep squashing every few minutes. When golden and crisp take out of the oven and let cool on a wire rack. To make the filling; pour the cream, icing sugar and vanilla into a bowl and whip up until it forms stiff peaks. To assemble, get 3 pieces of the puff pastry and pipe or spread the cream onto 2 of the pieces. Place around 5 berries on top of the cream and stack on top of each other and finish with the 3rd on top. Sprinkle with some icing sugar and viola…. High tea a ready. What are some of your high tea treats? I’m not at all a fan of the heat either, lucky we live in England & Ireland then! Whereabouts are you from in Ireland, by the way? Oh wow i didnt realise there was a moomin shop in London, if i go to London again that will definitely be the next stop! Yeah dublin is really close to me, about an hour. I’ve never been to limerick… one of those places i always forget that’s there, i must check it out though. Thanks Dina… they really were!